3 designs are in this chart pack. They include a Rams Head, Indian with Buffalo and Indian with Wolf. Small southwest Indian designs and borders include buffaloes, coyotes, lizards, cactus, antelope, llamas,wild ponies, iguanas, thunderbirds, adobe huts and Indian women. 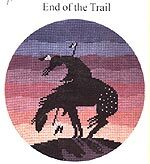 End of the Trail Counted Cross Stitch Kit -Stitch Count 106Wx107H - Kit includes separated DMC floss, 14 ct. Aida, needle, instructions and charted design. The Outline of a horse in one design and a fox in the other. Both have different images inside of them. Indian Headdress. 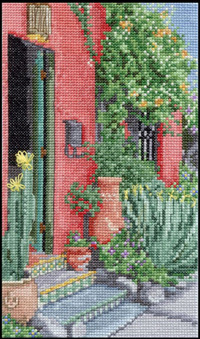 Beading instructions are included for those who wish to enhance the cross stitch with beads. 5 designs include Spirit Horses, Fancy Dancer, Chief Seattles Testimony, Warrior on a Horse, and Piece Pipe. many designs include bead work options. "From the Spirit of nature series. Moose outline filled with many other images of animals and southwest accents. Also Includes the Lion design. " Several designs shown on the front cover include End of the Trail, Spirit Horses and Medicine Wheel. Cheif Seattle's testimony (on back cover)is also included in this book. Kit includes sorted DMC floss, 14 count aida fabric, chart, needle and instructions. Western designs include saddles boots cowboy hats horses which are all great for wearables. Also includes a country music design.